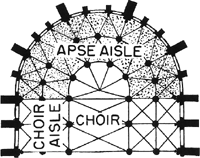 Pertaining to an apse or similar to one. Axial precession works in conjunction with apsidal precession and occurs on a cycle averaging 23,000 years. SOLAR POWER: The Real Force Behind Climate Change? It too is a hall church with tall octagonal piers and an apsidal east end, one portal at the west front and two portals on the north, as well as the south, side, and just one sturdy, square, spireless tower on the southwest side. Consistent with all conventual churches, the choir in Santa Maria dei Servi occupied part of the nave, and its length changed over time because of modifications in the apsidal area (Urbani, "Storia e architettura" 26, 113). In the 1190s after the re-conquest, the little mosque came into the possession of the Knights of St John and a large apsidal chancel with an altar was added to convert the Bab el-Mardum Mosque into an axial church. Splendid mosaics adorn each of the three apses, the apsidal arch and the facade of the cathedral built by Bishop Eufrasius. 55) Holloway's assertion implicitly referring to apsidal half-domes might be enhanced to include the loftier, full ceiling dome(s) so characteristic of East Christian churches, for they are effectively floating baldachins for the altars below them. Another tragic loss, architectural this time, is of a lovely apsidal chapel photographed by Enlart in the 1890s which was located about 12 meters off the northwest corner of St.
Utilizing common architectural features of Roman public buildings, such as the basilical layout and the apsidal wall, the synagogue housed communities who gathered to worship the god of Israel. The outdoor area will feature large-scale garden sculptures, water-features, seats and planters while smaller dishes and vases will be seen in cases in the Apsidal Gallery at one end of the Orangery. Reobservation of the orbits of ten spectroscopic binaries with a discussion of apsidal motions. dump deposit above the Apsidal Building: a large marble egg-shaped object (S-2879; Fig. Gaul Utopia, Fontevrault's abbey church is laid out with an eastern apsidal end while the cloister is arranged along its southern flank.